In the late 70’s my neighbor, Lucy, had a copy of Molly Katzen’s Moosewood Cookbook. It was hot off the press and causing quite the stir. Back in the day! Molly Katzen and Alice Waters were changing the American food scene forever. God bless the pioneers! They ushered in lots of fresh ingredients with bright spices and herbs. Gone were the days of bland food and opening up cans of food to mix together and give it a fancy name. Ugh! Cookbooks like Betty Crocker’s that had been standard fare for a couple of decades began collecting dust. Those books are collectibles in thrift shops. I have yet to find The Moosewood in a thrift store! I got my own copy of Moosewood soon after Lucy shared her copy with me. I happily cooked my way through most every page. Thirty-five years later, I still go back to my well-worn copy for some of the more memorable dishes. The pages are falling out, but the print is still clear, at least where the food splatters were not too dense. 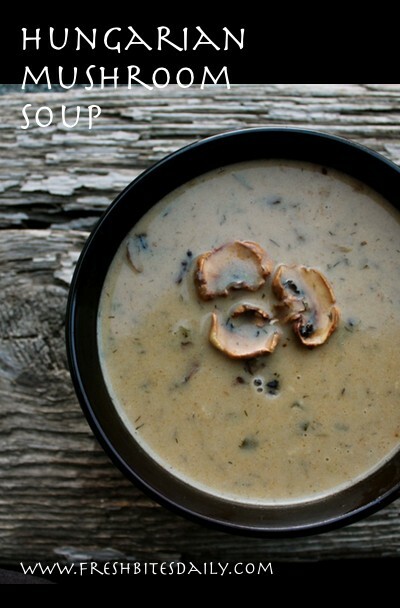 One of our lasting favorites is this mushroom soup. Of course, I have adapted it a bit over the decades, but anyone who tasted Molly’s soup would find this one quite familiar. 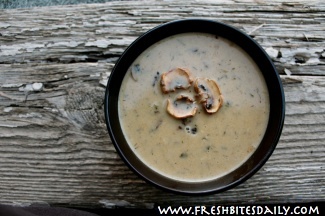 Rich and satisfying, Hungarian mushroom soup can turn a simple meal into a celebration. Serve it with a simple green salad and crusty sourdough bread with lots of butter. Oh my, yes! When the butter begins to bubble, add the onions. Sauté until the onions just begin to brown. Add the mushrooms, stir and cook for about 5 minutes. Add the dill, paprika, salt, bone broth and wine. Stir well to combine the seasonings. Turn the heat to low and simmer for 15-20 minutes. In a small bowl combine the cream and the thickener. Stir well to ensure no lumps. You do not want this beautiful soup messed up with lumps! Slowly add the cream mixture to the soup, stirring all the while. Continue to stir for another couple of minutes while the soup thickens. Do not boil. Add the lemon juice now if you opted to not use the wine. Make any necessary adjustments on the thickness: More broth to thin it down, more cream and thickener to thicken it up. When the soup is the consistency you like, check for salt. Make adjustments. Ladle the soup into warm bowls and garnish.